CJHARLOTTE, N.C. (AP) Gregg Popovich felt the San Antonio Spurs caught a scheduling break playing Charlotte on Saturday, one night after the Hornets played on the road at Cleveland. It led to an easy night for the Spurs. 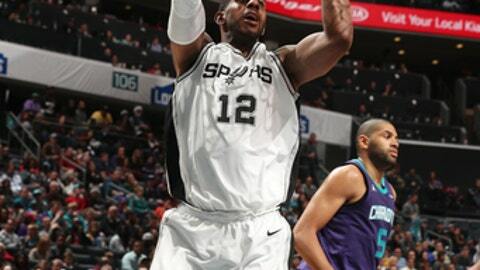 Pau Gasol and LaMarcus Aldridge each had 17 points and seven rebounds, and San Antonio held the Hornets to 37 percent shooting in a lopsided 106-86 victory. Hornets coach Steve Clifford agreed. Sensing the Hornets had a chance to beat the Cavaliers on Friday night, Clifford played his starters extensively in the second half. The Hornets lost 100-99 to the Cavs and it ultimately may have cost them the game against the Spurs, too. The energy the Hornets played with at Cleveland was not there, and it seemed to show early on as they missed a variety of open shots while shooting 22 percent in the first half. Rudy Gay added 15 points for the Spurs, who snapped Charlotte’s three-game home win streak. The Hornets entered the game 7-2 at the Spectrum Center, but missed 35 of 45 shots in the first half and fell behind by 11 at the break. They could never make a serious run at the Spurs. Kemba Walker, who left the game briefly in the third quarter with a left shoulder injury, returned to finish with 18 points on 8-of-12 shooting. He didn’t get much help as Charlotte’s four other starters – Nic Batum, Dwight Howard, Michael Kidd-Gilchrist and Marvin Williams – were a combined 6 of 29 from the field. The Hornets cut the lead to 50-42 in the third quarter, but the Spurs responded with a 9-0 run highlighted by Kyle Anderson’s steal and dunk. Charlotte could never cut the lead to single digits after that point. ”Just ball movement, making the extra pass, trying to get to the rim and just finding the open guy,” Aldridge said. Spurs: Anderson tied a career high with five steals. … Outscored the Hornets 22-8 in the paint in the first half. … Shot 6 of 25 from 3-point range. Hornets: Howard was fined $35,000 by the NBA earlier in the day after making an obscene gesture to a fan during Friday night’s 100-99 loss at Cleveland. …. Howard has 244 rebounds, the most any Charlotte player has had through the first 19 games of a season. There was a scary moment in the third quarter when Walker went down with a left shoulder injury after colliding with Aldridge on a screen. Walker remained on the floor in the fetal position for about a minute before being helped up and taken to the locker room. He was diagnosed with a bruised left shoulder and returned to the game later in the quarter, but the Hornets were already down by 15. Clifford said he breathed a sigh of relief when he saw Walker return to the bench. Gasol sensed the Hornets were a little down when Walker left for the locker room. The first quarter might have been one of the ugliest of the season for both teams. The Hornets led 15-14 after 12 minutes despite hitting just 5 of 23 shots from the field. The Spurs weren’t much better, converting just 6 of 23. Spurs: Host Mavericks on Monday night. Hornets: Visit Raptors on Wednesday night.